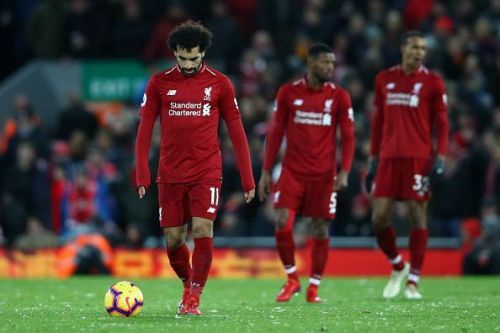 Liverpool squandered a seven-point lead over Manchester City to drop one point behind them in the Premier League table on Sunday. The goalless draw at Goodison Park in the Merseyside derby allowed Pep Guardiola's men to take pole position and leave Jurgen Klopp's challengers lurking at second. It has been clear for some time that Liverpool have been struggling but to give away a seven-point advantage was criminal, and to miss out on chances which came their way on Sunday the clear denominator. Liverpool talisman Mohamed Salah has endured a frustrating run in front of goal over the last month or so. He has seventeen goals in the Premier League and three in Champions League this season but surprisingly, the Egyptian maestro has scored just once in Liverpool's last six games and that is a depressing statistic. In that time, the Reds have had two goalless draws against two bitter rivals- Manchester United and Everton. They have won just the two games in that period. This record clearly shows that Salah is the source of goals for Liverpool and when he doesn't score, the team suffers. Salah had his finest moment this season when he tucked in three against a hapless Bournemouth side at the Vitality Stadium in August en route Liverpool's 4-0 win but the goals have come in trickles after that, save the brace he bagged against Crystal Palace at Anfield in a 4-3 win in January. The right winger has dominated passages of play but has not really been able to convert those moments into goalscoring opportunities. It did not help when goal poacher Roberto Firmino picked up an injury against Manchester United at Old Trafford and left Salah alone to his woes. Salah's equal on the left-wing, Sadio Mane, has been in ominous form of late, and has scored six goals in Liverpool's last seven games. However, that has not quite rubbed on to Salah, and the Egyptian needs to improve for Liverpool's sake. The Reds need their talisman to be back at firing all cylinders and he must find a way to shrug off the poor patch of form he is in.